Meghan Markle has the sweetest message engraved on her Cartier watch | HELLO! May 09, 2018 - 19:45 BST Sophie Hamilton Meghan Markle owns an elegant Cartier watch with a special message engraved on it. Find out the meaning behind the secret words. Meghan Markle is known for her love of jewellery, from her dazzling engagement ring from Prince Harry to dainty charm necklaces and on-trend stacking rings. The bride-to-be also owns a Cartier Tank Française watch, which retails at £4,800 for the small face model. The timepiece is particularly sentimental to Meghan as she brought it as a present to herself to celebrate her own career success in TV series Suits, and had a very special message engraved on the back. Back in 2015, Meghan told HELLO! 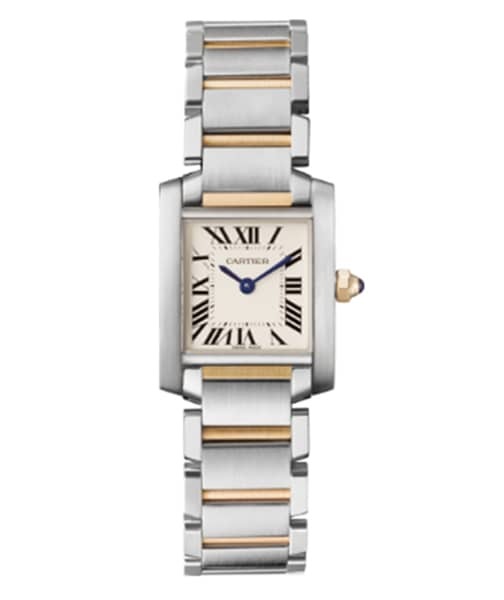 : "I’ve always coveted the Cartier French Tank watch. When I found out Suits had been picked up for our third season – which, at the time, felt like such a milestone – I totally splurged and bought the two-tone version. I had it engraved on the back, “To M.M. From M.M.” and I plan to give it to my daughter one day. That’s what makes pieces special, the connection you have to them." How sweet is that?! In the same interview Meghan spoke of the jewellery she wore on Suits, revealing that she chose to wear pieces form her family's own collection for the show. She said: "We wanted Rachel’s jewellery to feel personal, like family heirlooms. I’ve actually worn my grandmother’s charm bracelet and pearls from my mom on the show. It's funny, because my first name is actually Rachel, so even my signet ring actually has the initial R."
READ: Who are Meghan Markle's parents? All eyes will be on the Meghan to see the jewellery she chooses for her wedding day on 19 May. Of course, her engagement ring will be on show - the stones were specially selected by Prince Harry, with the central diamond from Botswana and the other two diamonds are from his late mother Princess Diana's personal collection. RECOMMENDED: What is Meghan Markle's net worth and how much did she earn on Suits? The couple's wedding bands will be made from rare Welsh gold from the Clogau St David's mine at Bontddu, North Wales. The royal wedding tradition goes back 88 years, and was most recently continued by the Duchess of Cambridge, who chose a band made out of the precious metal for her wedding to Prince William in 2011. Did you spot this hidden detail in Meghan Markle’s outfit for the Queen’s birthday?